Describe the scene in the photograph and explain how the geography influences literature and culture. 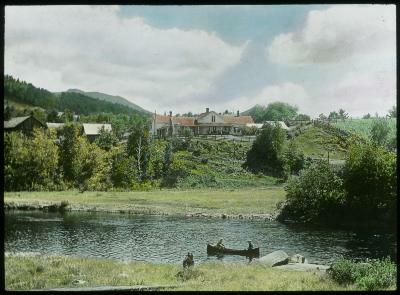 Baker Cottage, also known as the Robert Louis Stevenson Cottage, at Saranac Lake in New York's Adirondack Mountains, 1912. Baker Cottage was home to writer Robert Louis Stevenson for six months during the winter of 1887-1888. He traveled to Saranac Lake seeking treatment of tuberculosis. Following his departure he wrote a positive review of time at Saranac Lake for the "Evening Post." What time of the year might this picture have been taken? Why? Research Robert Louis Stevenson. Who was he, when did he stay in Baker Cottage at Saranac Lake, and what did he do while he was there? Do you think this photograph was taken when he lived there? Math: Research how long Lake George, Saranac Lake, and Lake Placid are in miles. Convert the lengths to feet. Rank the lakes in order from largest to smallest. Science: Investigate the lakes mentioned above. What fish and wildlife could you find at these lakes? English Language Arts: Create a travel brochure for people traveling to the Adirondack lakes. Be sure to include major points of interest.